Under the National Endowment for the Arts (NEA) Challenge America grant, a new public art piece is under way. I (Amy Ruza, Education Programs Coordinator at The Rockwell) am collaborating with metal artists Tony Moretti and Gwen Quigley from Hammondsport, NY to create a sculpture made from glass, metal and natural materials. We’ll celebrate the unveiling of the artwork at the Garden of Fire Festival, held at CareFirst this coming August 2015. We are combining our glass-blowing and metal-working skills to fabricate a mixed-media sculpture that connects to the themes of the summer youth program. 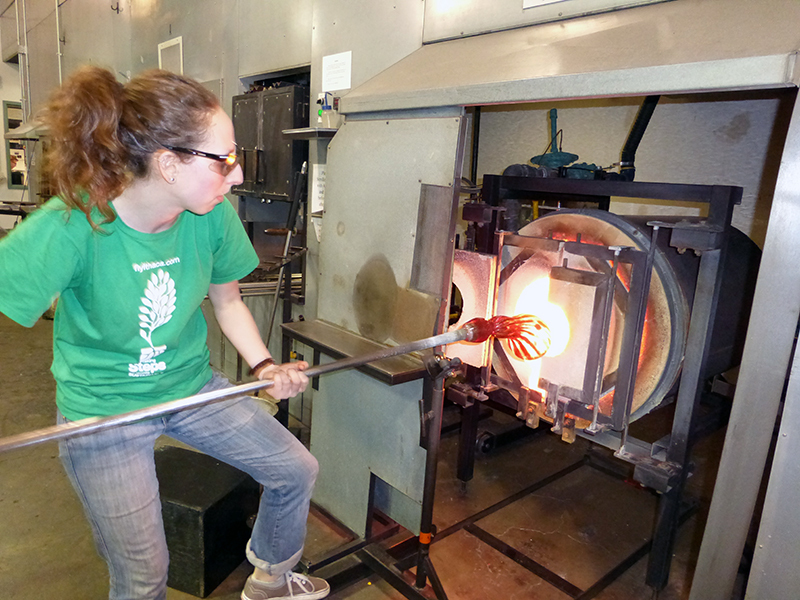 Artist and educator Amy Ruza gathers glass to create a glass squash. The carefully-planned design puts a twist on the traditional Iroquois (Haudenosaunee) “Three Sisters” crops: corns, beans and squash. The sculpture will also invoke the importance of wind in gardening, related to pollination, and the use of wind energy to help sustain plant growth. A tall sunflower with a glass center, surrounded by spinning metal petals. Below, spherical glass peas in metal pods, along with a glass squash plant with large, twisty metal leaves and vines. 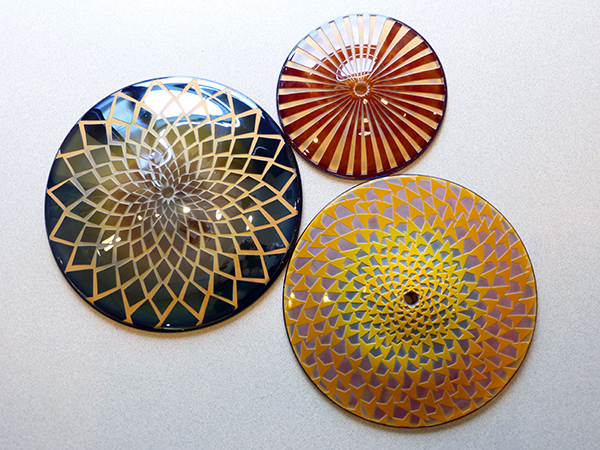 These colorful glass mandalas will represent the centers of the sunflowers. The blown-glass parts were made at The Studio at the Corning Museum of Glass in Corning. Tony and Gwen will fabricate the metal parts at their home studio. The completed sculpture will be relatively easy to install and de-install, making it a non-permanent sculpture with the goal of being re-exhibited at multiple locations around the region. While it is certainly necessary for youth to create art themselves, it is equally as important to expose them to professional-quality, contemporary, artistic creations. Art inspires us by provoking creativity, an awareness of new ideas, and giving us an experience that engages all of our senses, enlightening our spirits and connecting us as people. 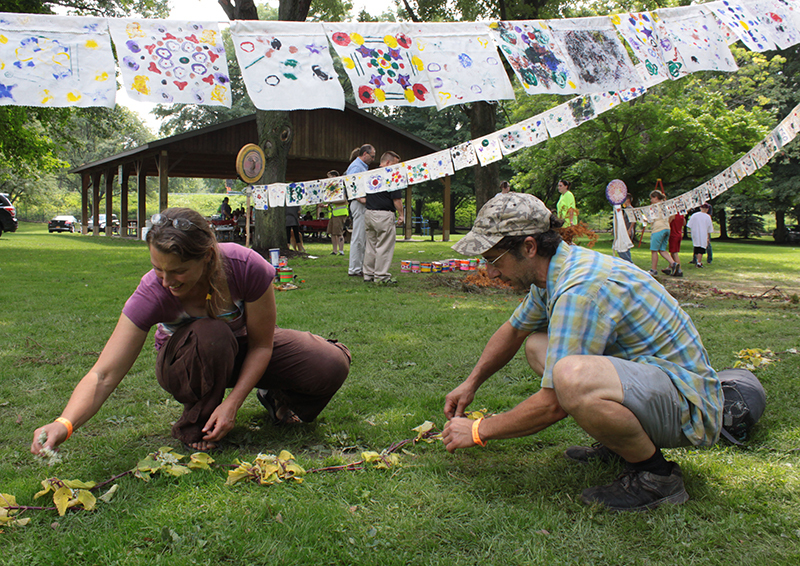 Participants will recognize artists Tony Moretti and Gwen Quigley from their participation in last year’s Garden of Fire program. The sculpture will show how artists from different backgrounds can work together to create something harmonious to share with the world. We are grateful for this artistic opportunity to stay involved in the community as artists and to have this chance to work together to experiment with new ideas. Receiving the NEA grant has opened up a creative doorway into a new collaboration with exciting, technically challenging and inspiring ideas to interweave blown glass, metal and other natural materials. Stay tuned for the completion and unveiling of this sculpture at the Garden of Fire celebration on August 14, 2015!